Despite a reputation for innovation, Audemars Piguet is also steeped in tradition. after 136 years it is still owned by the founding family and offers a perfect blend of old and new. The Swiss watchmaking industry is steeped in tradition. And right at the heart of that tradition sits family-owned Audemars Piguet. It is one of the few of the great watchmaking houses still owned by the founding family.That’s impressive continuity for a firm established over 130 years ago. But despite these strong and unbroken links with its heritage, Audemars Piguet remains widely recognised across the world as a leader in the cutting edge of watch technologies. Audemars Piguet is simply where the past and the future meet in the present. Flamboyant and creative, as well as being practical and desirable, Audemars Piguet watches have always been an inspiration to the rest of the industry. From its earliest days, the manufacturer has supplied the ideas, inspiration and the innovations that have transformed the industry. When it was first founded, Audemars Piguet made bespoke complications for the gentry. Today it continues to make very limited edition special watches that appeal to the higher echelons of the market. The first minute repeater, a pocket chronograph and the first wristwatch with a minute repeater were early achievements. This innovative streak continues in Audemars Piguet’s specialist watches today, as limited edition specials and onc-off pieces — often in unique materials — offer unique and highly prized products that watch lovers can’t get anywhere else. In recent years, demand for larger watches has grown. But Audemars Piguet prefers to set trends rather than follow them. As far back as 1915 it established a reputation for thin watches that offered better movements than bigger offerings sold by rival firms. Although the firm was more than capable of going Large (its 1972 Royal Oak model was nicknamed the Jumbo) Audemars Piguet designers also became known for their ability to do more with less. In 1915, for example, the firm offered a wristwatch with minute repeater at just 8.3mm, then by far the world’s thinnest. From the slimmest pocket watch in 1925 to the world s first skeleton watch, right up to the thinnest automatic movement in 1967, Audemars Piguet developed a reputation for design excellence. Today the Jules Audemars Perpetual Calendar boasts more than 350 components — somehow squeezed into a case just 9.15mm thick. Audemars Piguet’s watchmakers are masters at understanding the rules and essentials of the industry. Unlike many of their more conservative peers, Audemars Piguet encourages it staff to draw on this experience to have the confidence to throw the rule book out of the window. Nonconformist and visionary, Audcmars Piguet is unique among the top four Swiss Watch houses in its approach to watch making. It manages to apply all the conventions of the Swiss watchmaking tradition, while at the same time breaking enough rules to give its watches a unique quality that many others lack. Despite only making and selling limited quantities of watches — certainly compared to some of the bigger houses — Audemars Piguet still produces a huge variety of different case shapes. This allows the firm’s designers to be increasingly inventive in their watch designs and to make sure they use the perfect case shape for each new watch, rather than fitting new watches into standard shapes and sizes. 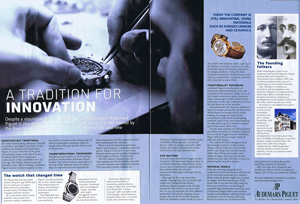 Small scale production also allow the firm to focus on producing the very best watches. From the very beginning, the firm’s confidence to innovate has included the use of the very latest materials in its watches. While many think this might have reached its apogee with the introduction of the Royal Oak in 1972, today the firm is as inventive as ever working in specialist high-performance materials, such as titanium, forged carbon and ceramics. Quality watchmaking is about precision and dedication. Over its history, Audemars Piguet has drawn on and developed the early passion for creating the perfect watch that inspired its founders. After 136 years, few companies and watches are able to match an Audemars Piguet. Isn’t it time you joined the family? If I’ve learnt one thing.